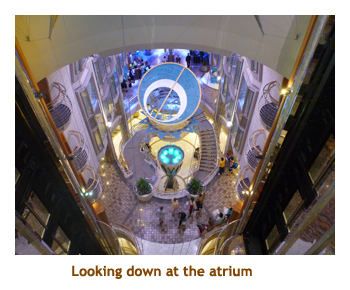 We had booked the Symphony of the Seas on a seven day itinerary and decided that a second short cruise would make the trip worthwhile (ie. amortize the air fare). 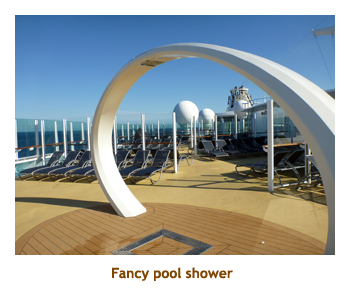 This cruise on the newly renovated Mariner of the Seas scratched several itches - it was a new-to-us ship, we had never sailed the Voyager class before, it was fresh from a huge renovation and it was doing a warm climate. This was perfect to back-to-back with the Symphony. 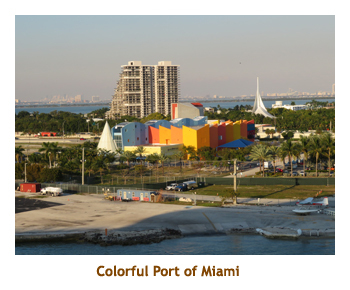 The only drawback was that the ships' schedules didn't quite line up, meaning that we would need an overnight stay in Miami between the two cruises. The ship was very nice and the refurb really showed. 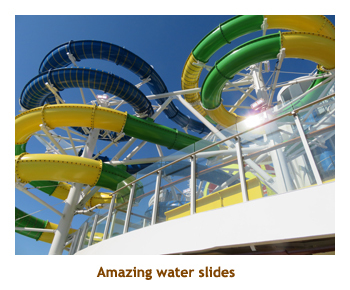 Most of the updating seemed to be on the pool deck - with an added flow rider, virtual reality bungee jumping and water slides. The ship was quite full with 3538 passengers (3114 double occupancy, 4252 max). The weather overall was cool. Often a sweater or sweatshirt was needed, especially when it was windy. But then, The Bahamas (and Miami) are often cool in Jan / Feb. 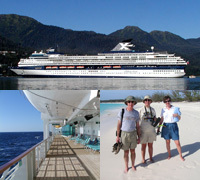 I gave the itinerary a 3 star rating as it was only 4 nights and hit only Nassau and Coco Cay, but what can you expect on such a short cruise! By the way, Marjorie has asked for me to indicate her dinners as well and I gladly will post what she had for those evenings that she remembered to note. The cruise line has changed the dress code for the Mariner, but not fleet wide. Whereas the Symphony still has "casual" and "formal" nights, the Mariner has "Laid Back Lounging" and "Wear Your Best" nights. The Cruise Compass even says "Say goodbye to Formal Night". The actual dress varied from jeans / shorts and t-shirts to suits / tuxes. No one was turned away. If only the rest of the fleet would follow suit (no pun intended)! The diary for the Caribbean Cruise on the Symphony of the Seas is a separate diary. After saying goodbye to the kitties (about 5:30 PM), we drove over to Christina's and had some farewell pizza. She drove us to the airport and dropped us at the Marriott Hotel. 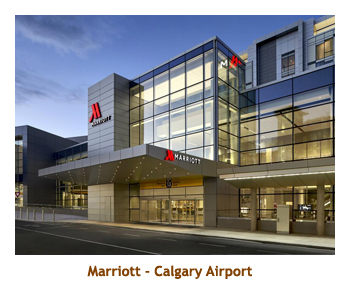 Once again we were overnighting right at the YYC airport because our flight was so early. We would be doing a 2-leg flight through Toronto. We were up at 4:30 AM ready to checkin to our 7:00 AM flight to Toronto. There was a short lineup through US customs, and security was a breeze. We were in the waiting room in plenty of time. We were a bit worried because Toronto was supposed to get some snow, but all went well. We arrived in Toronto about 12:30 and had a long wait until our 6:30 PM flight to Miami. 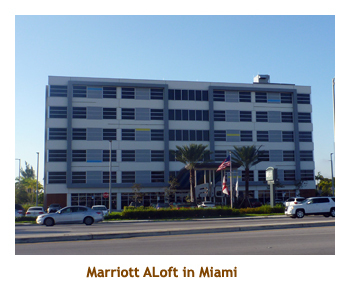 We arrived in Miami about 9:30, retrieved our luggage and shuttled to the Marriot ALoft Hotel. Note: A couple of weeks before the cruise our local TD bank recommended we get a pre-paid US Visa card instead of carrying a lot of US cash with us. So we loaded up a card ready for the trip. (It's a oneway load -process - I could easily move money online from my USD account to the pre-paid card, but the only way of removing money from the card was to spend it). Anyway, the first opportunity to use the card was while checking in at the ALoft Hotel. "I'm sorry Ma'am but we don't accept prepaid cards". Arrrrgh! Fortunately we didn't have any problem with the card at our other hotels and grocery stores. We went straight to bed and got up about 7:00 the next day. We walked to a nearby Denny's for breakfast. Then it was back to the hotel for the 11:00 shuttle to the cruise dock. The shuttle was about 1/2 hour late, but that was OK. There were lots of ships in when we arrived at the Port of Miami about noon. The Mariner was there waiting for us. Checkin was really fast at the brand new terminal building, and we were quickly aboard for some much needed lunch. Our cabins opened at 1:00 and our bags were there shortly after. I hung up all my stuff and we headed out to explore the ship. 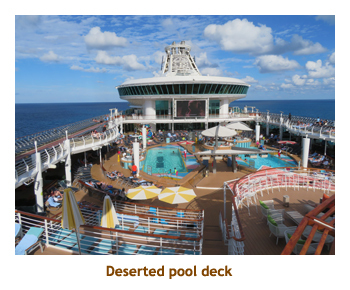 Having been on several Freedom Class cruises, the ships layout seemed familiar. We were booked for fixed dining and located our spot in the main dining room (MDR). Muster drill was at 3:45 and sail away at 4:30. Unlike most recent cruises where we had to gather indoors, this one was on the promenade deck, I didn't appreciate having to stand in a tight bunch for half and hour or so in the hot sun! I guess it was our 75th muster drill! Think we'd know it by now! For dinner I had prime rib, while Marjorie had the fish mash (white fish, shrimp and scallops). We finished dinner just in time to run down to Studio B to watch the ice show. It was very good. Then it was time for bed. Today we were in Nassau for the nth time, so we had nothing planned. We were up as we docked at 8:00. 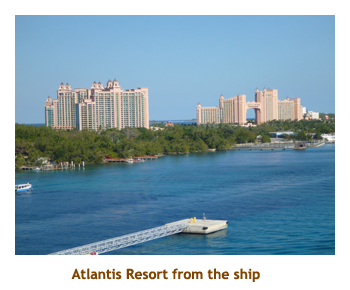 All of the previous visits we had done to Nassau were half-day slots, but this time we were docked until midnight. I figured it was either that it was our only "shopping" stop of the cruise, or that we only had a few miles to go to our next stop (Coco Cay). Either way it was a relaxing day for us. We breakfasted in the main dining room and I had my usual diced fruit and an omelet with everything. We showed up for morning trivia, but everyone was off the ship. There were only 5 of us so we were split into two teams. We ended up tying, so everyone got RCI pens. Woohoo! 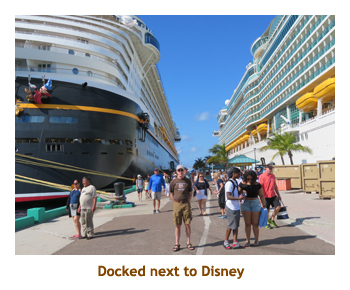 After a leisurely lunch at the MDR we left the ship and wandered the dock area for a bit. It was mostly tourist shops. 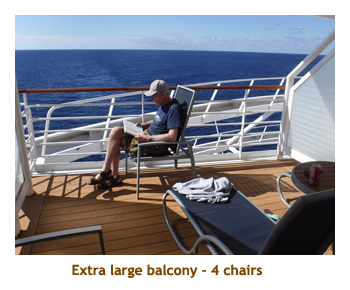 Then it was back aboard to wander the ship and read our books. Nice having the ship to ourselves! For dinner I had lamb shank which was huge. We didn't do any special entertainment so just wandered and then went to bed. 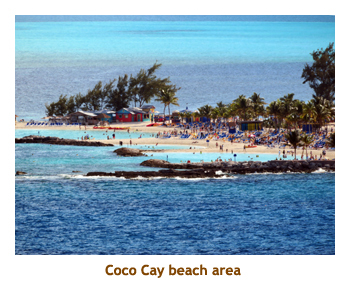 Our next (and final) stop was at Coco Cay - RCI's private island. We slept in until 8:00 as we were anchoring just off the island. This was a tender site. 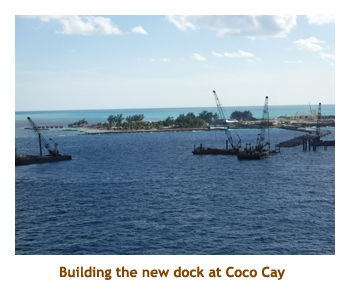 The island was under reconstruction with a huge theme park and a real dock for the ships. We decided to forego checking out the construction close up and instead made it a day on the ship. We ate breakfast in the MDR where I had my daily omelet and fruit. We attended two trivias - both almost empty - and won twice. Lunch was in the Windjammer (buffet) where it was very quiet. No problem getting a seat! In the afternoon we read and wandered. It was a sunny warm day. For dinner I had seafood linguini. Note: I should mention our dinner mates. We had fixed seating (early) dinner and were put at a table for 8 of which 7 of the seats were filled. We had a nice time each evening. There was a retired couple next to us from the southern states (Kathy and Rick), and a young/middle aged trio of Afro-Americans (husband, wife and man's friend) across the table. It turned out that Kathy was very religous (Evangelical) and the young man was a pastor. However, the topic never turned to religion and we had a fun time. Kathy asked to "friend" me on facebook which I agreed to. When I next checked my facebook I was spammed with a bunch of religious postings. There ensued a very quick "unfriending". Today was a day at sea as we motored back towards Miami. We were up at 8:00 and the ship was moving very slowly (not far to go). 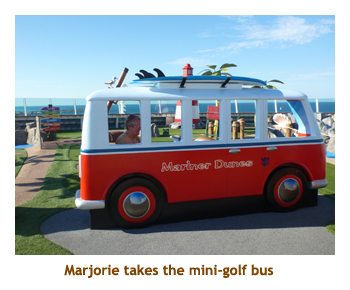 We had breakfast in the MDR and spent the morning at trivia, reading and wandering. 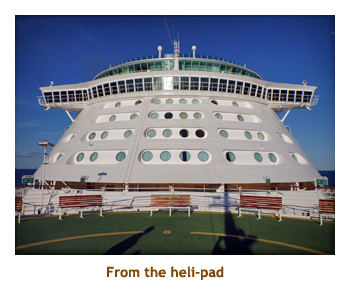 It was really pleasant wandering the various areas of the ship. We had lunch in the MDR. 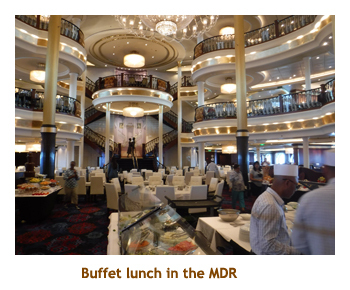 The MDR lunches always include a fantastic salad bar (as well as menu service). I love the salads as there are a zillion ingredients of which I request most of them. It makes a large salad, but it's oh so good! We enjoyed a relaxing afternoon just hanging out. For dinner I had the rack of lamb. It was excellent. Oce again we forego'd the entertainment and instead wandered the ship. We got up early, breakfasted and were off the ship by 8:30. We grabbed our luggage in the terminal building and went through US Customs. The customs process is mostly automated now. 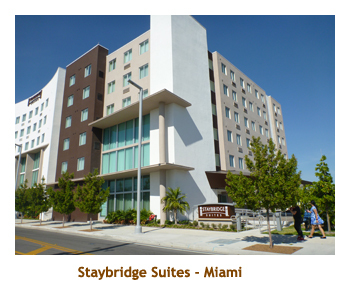 We caught the Staybridge Suites airport shuttle and were soon to our hotel checking in. It was around 9:30 and they had one room ready (lucky us! ), so we were able to drop off all our stuff. We grabbed another hotel shuttle to a nearby strip mall. We scoured K-Mart for a while and found some snackies for the next cruise. 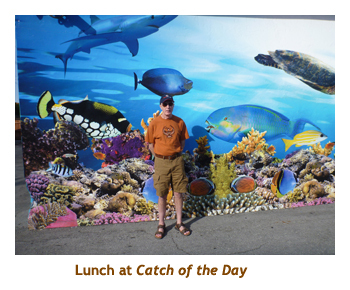 The shuttle driver had recommended a good sea food restaurant for lunch (the Catch of the Day) that was about 8 blocks away. We walked to the restaurant and were struck that the surroundings seemed familiar. Then we saw across the street the Fairfield Inn that we had stayed in a few years back. Then I realized that we had been to the strip mall before too. We had a good lunch which did us for dinner too. I had a Mahi Mahi wrap and Marjorie had a fish sandwich. Back at the hotel we watched some Ozzie Open tennis and went to bed early. The next morning we had breakfast at the hotel and then caught the hotel shuttle to the cruise dock. 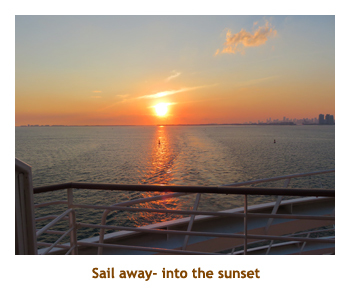 For the continuation of our trip, please visit the Symphony of the Seas trip diary.